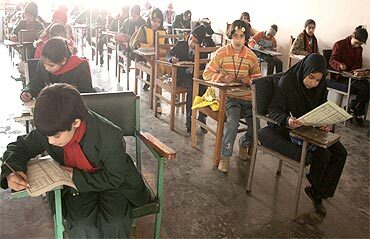 Rediff.com » News » Pix: No winter vacations for Kashmir students! 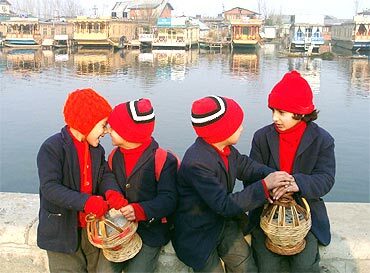 Pix: No winter vacations for Kashmir students! For the first time since modern education was introduced in the Valley during the rein of the Dogra Maharaja Pratap Singh who ruled Jammu and Kashmir from 1885 to 1925, secondary and higher secondary schools would remain open despite the bitter winter cold. 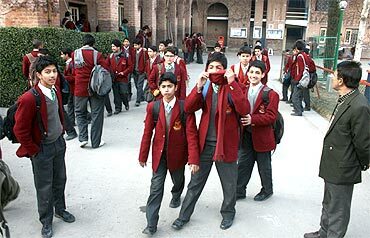 Winter vacations in secondary and higher secondary schools have been cancelled to make up for the time lost during the over five months of unrest in the region during the summer, the state government. No winter vacations for Kashmir students! An order issued by the government has instructed headmasters and principals of 272 secondary and higher secondary schools that classes for students from Std IX to Std XII shall continue uninterrupted during winter. All educational institutions normally remain close during the two-and-a- half months from late December to end of February because of the harsh winter. Senior officers of school education department said the decision was taken to make up for the lost time during unrest when most schools remained closed. J&K Chief Minister Omar Abdullah has been approached for additional funds to arrange for heating arrangements inside the classrooms during winter. As a bonus for the teachers, who hold classes during this period, the government has decided to grant earned leave benefits. The teachers will be entitled to additional salaries for working in winter. Many locals are, however, questioning the wisdom of the decision according to which children would have to attend classes in sub-zero temperatures. "It is not only the question of arranging heating inside the classrooms. 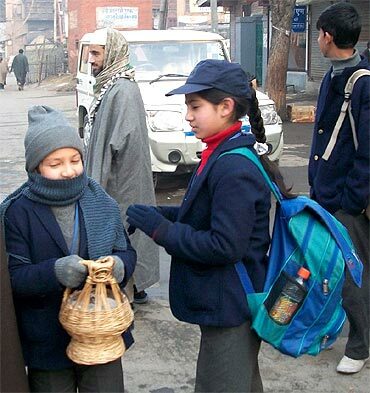 How do the children get to school in heavy snowfall and extreme cold," asked Basharat Ahmad, father of a Std X student. Others say what use is the class work when exams for various classes from Std IX to Std XII have already been held. The education departments feels the decision to cancel winter vacations will work in the favour of the students. "These classes will act as coaching centres for our children who have not completed their syllabi during the academic session. After all, our children have to face competition from Jammu students and those from other places in the country where normal schooling continued uninterrupted during the period schools remained closed in the Valley," said a senior officer of the school education department.